Tamgaly ili river. Description of beautiful place for tours and excursions in Kazakhstan. The history of Tamgaly complex is closely connected with the period of the highest military and political power and cultural prosperity of Jungar khanate (1635-1757) when the Lamaist Buddhism was spread intensively among Oirats - the West Mongolian tribes.The choice of the place for the ceremonial complex has been determined by the natural landscape of Tamgaly so that this space could be organized accordingly. 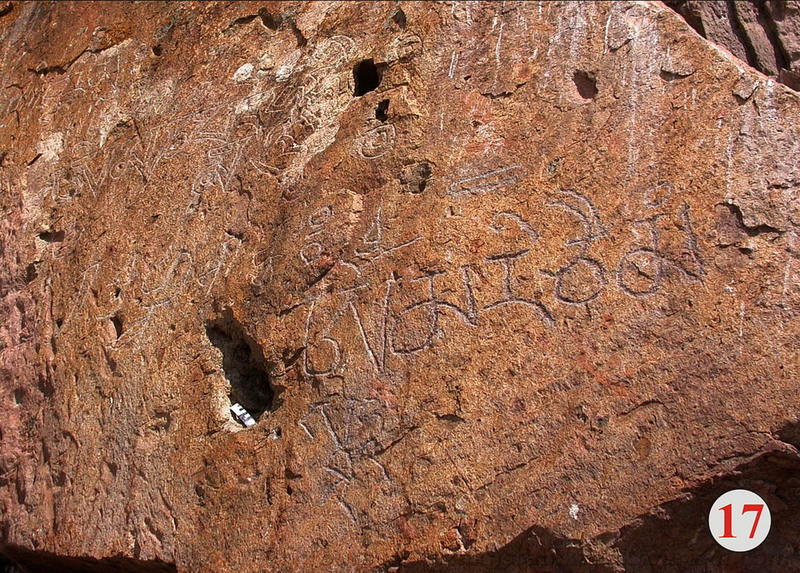 There is a significant rock massif with fifteen smaller rocks around it that are covered with different images and inscriptions. There are four stages of the complex formation separated in accordance to the characteristics of iconography of pictured figures, paleography of texts and the methods of execution.On the first stage a group of pictures was created including the image of Shakyamuni Buddha, the bodhisattva Avalokiteshvara showing "the one-faced and four-handed" god Buddha Bhaishadjyaguru accompanied by some Tibetan inscriptions on the central panel (plane number 4), the figure of Budda Nageshvararadzhi (№ 2), as well as a variety of prayer texts, including two mantras of the Buddha Manjushri, who is not pictured on the monument, appeal to the Panchen Lama Choychzhi Chzhaltsanu (№ 11) and four six syllable mantras "omma ni padme hum», engraved on different stones on the periphery of the gorge(№ 1, 5 , 13, 16).In the second stage of forming of this religious complex ten repetitive texts of six syllable mantra made by Oirat «clear writing» (№ 10, 13-15, 17) have been engraved. Some more images were added in this sanctuary at the same time or a little earlier. 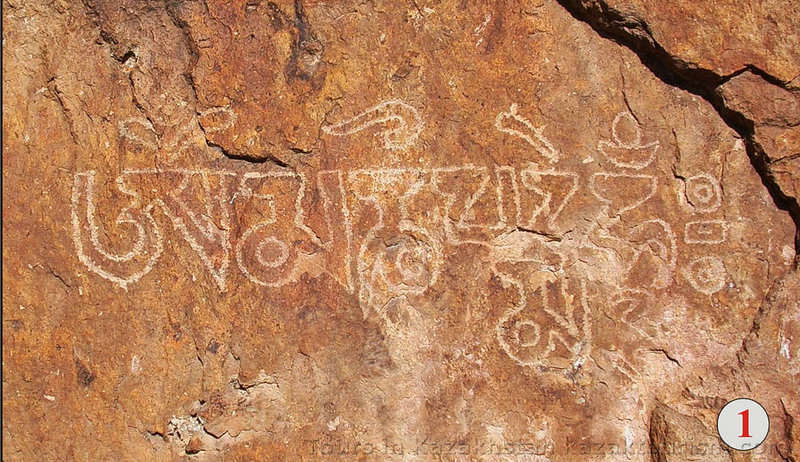 The image of Buddha Amitabha (№ 10) appeared first and a new cycle of Tibetan epigraphy was formed around it later. In the third stage a mantra dedicated to Amitabha appeared next to its image. 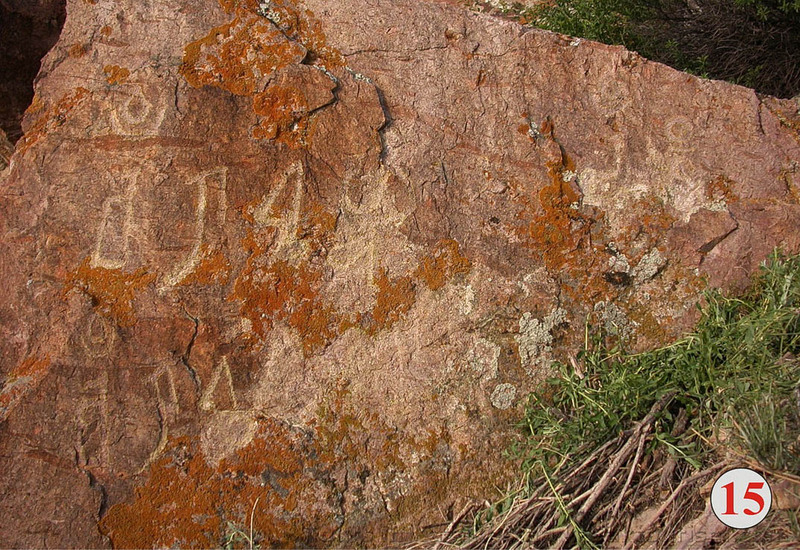 There are some more engravings on different edges of surrounding stones like series of Tibetan inscriptions, including three six syllable mantras (№ 7, 9, 10), the inscription "Be praised, Lama, with a good mind…knowledge and mercy", addressed to Buddha Sakyamuni (№ 8), and two Manjushri mantra on the southern periphery of the sacred land (№ 17).The final, fourth step of the formation of the complex was the creation of the longest text in Tamgaly, reproduced in 11 rows by the italic «clear writing» (№ 11); in modern translation made by N.S. Yakhontova the text contains thanks to imagined here Buddas and Bodhisattvas for «overcoming the danger of diseases and famine» (Oirat. zuda; Kazakh. Žut) and wish to gain «a lovely peace in this country continuously and uninterruptedly». Most probable creation date of the early images and inscriptions in Tamgaly is the period from December 1676 to March 1677. The place for the Buddhist sanctuary had been chosen most probably because of the special beauty of the picturesque landscape and its location near one of the major water passages of Ili Kapshagai.In Kazakhstan there are more than 20 monuments of Tibetan Buddhism of XVII - the middle of the XVIII century. 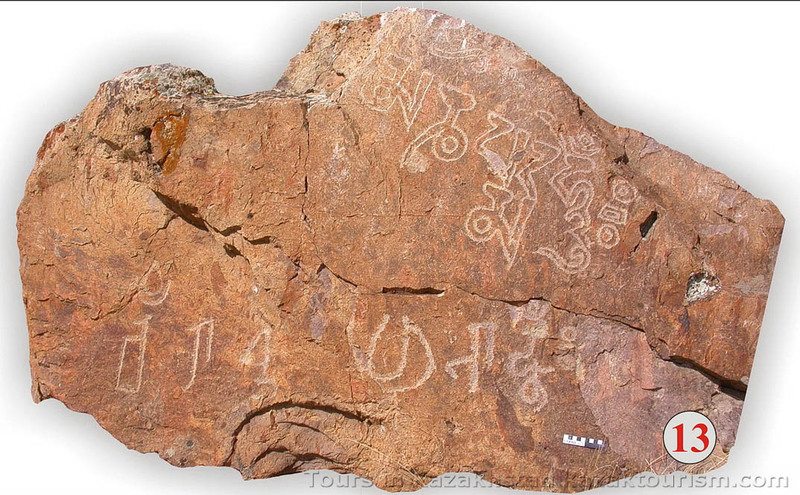 However, a monument in the Ili Kapshagai has no analogues in the western part of Central Asia neither by the composition of the characters represented in Tamgaly Tibetan pantheon, nor by the number of texts - different in content and language. 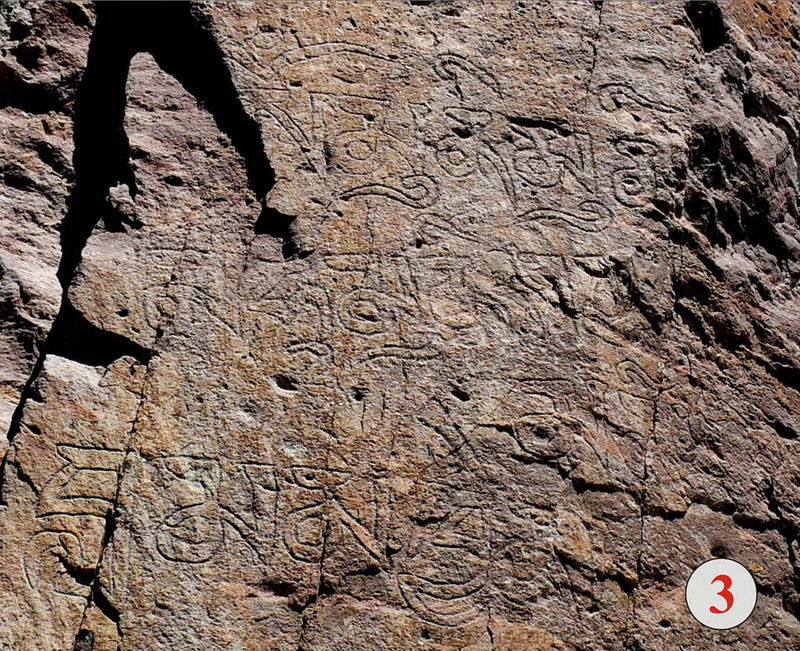 The stones of Tamgaly are remarkable for their artistic value, variety of epigraphic texts and duration of the period of their creation. This is why the sanctuary on the bank of Ili river was so important in the era of its appearance and functioning.